Mix it up with our personal training system — portable full-body exercise for clients of all ages! The MOTR combines the core training of Pilates, the strength and power of aerobic conditioning, the functional exercises of a pulley system and the balance and release exercises of a foam roller, MOTR gives you everything you need to teach classes, small group or one on one training. MOTR is the ideal compliment to a Pilates, personal training or rehabilitation practice enhancing balance, aerobic capacity, strength and flexibility while performing fun, functional exercises clients respond to and enjoy. The Fundamental MOTR course includes instruction on the basic movements in each exercise category as well as an introduction to the Balanced Body Programming System for easy class design to help you teach dynamic 30 – 60 minute classes with ease. 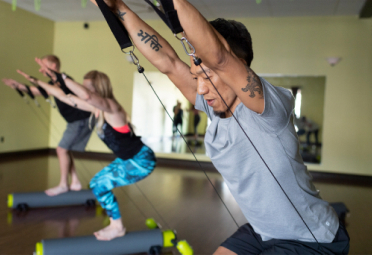 You will quickly see how the MOTR fits into any Pilates or personal training practice. The rounded surface of the MOTR adds balance and stability challenges to many exercises which creates a fun, functional training tool in a small footprint. The comprehensive MOTR instructor training includes instruction on all the MOTR exercises and variations and gives instructors everything they need to teach a variety of formats from small group personal training to circuit training to private sessions. You will learn to perform, teach and cue MOTR exercises in all positions to increase your confidence and get you ready to teach. Based on the Balanced Body Movement Principles you will discover how easy it is to design and deliver dynamic classes using the Balanced Body Programming System. The combination is designed to help you understand the purpose of each exercise, common regressions and progressions and how to program classes for students of all kinds. Exercise instruction in the fundamental MOTR exercise categories. Detailed manual, DVD and ongoing video support. Introduction to the Balanced Body Movement Principles to strengthen your teaching. The Balanced Body Programming System to help you design and deliver successful and effective classes. Progressions, regressions and modifications to make MOTR training useful for everyone. Sample classes to get you teaching right away.